Amatrol’s Portable Process Control Troubleshooting Learning System – Level & Flow (990-PC1F) provides a skill-rich, portable troubleshooting system for two of the most common types of process control systems, flow and liquid level, by providing eLearning curriculum and hands-on training for subjects like process control equipment safety, loop controllers, level measurement and control, control loop performance, and more! This system’s value is twofold: first it provides vital training experience for learners and professionals that will perform operation, safety, and troubleshooting on process control systems used in real-world industrial areas, including power generation, petrochemicals, food processing and manufacturing. Secondly, this system features industry-standard valves, switches, and gauges all within a portable basic process control learning system that can be placed on a conference room table, shop floor desk, or practically anywhere when training space is limited. The 990-PC1F features two portable consoles featuring a PID controller, operator controls, process meter, flow transmitter, water tanks, gauges, and FaultPro software, Amatrol’s electronic fault insertion software. These industrial components will be used to study troubleshooting topics for process control safety, interpreting instrument tags, valve and pump symbols, loop controllers, proportional control valves, display scaling, closed loop liquid level control, proportional control, flow sensors, and open-loop tuning all within an innovative, portable solution that doesn’t sacrifice the comprehensive knowledge and skill building for which Amatrol is known. This Portable Process Control training system includes portable consoles, liquid tanks, centrifugal pump, a piping network with valves, and a PLC interface. Learners will practice hands-on skills with these components to gain an understanding how process control equipment works. Skills highlighted by this system include connecting and operating loop controllers and diaphragm actuator proportional valves, using a multimeter to test pressure sensor operation, connecting and operating alarms on a controller, controlling a process using PI control, measuring flow using a paddlewheel flow sensor, and tuning a control loop using the process reaction curve method. Curriculum for process control training is provided in a stunning multimedia format. Learners will study: how an instrument tag identifies the function of a device, how to perform a display and key test on the Honeywell UDC 3500 controller, how to calibrate an I/P converter, how to program a Honeywell UDI 1700 process meter to perform on/off control, how to convert between velocity and volumetric flow rate units, and how to tune a loop using the process reaction curve open-loop method. Amatrol’s peerless interactive multimedia curriculum utilizes text with voiceovers, pictures, videos, stunning 3D animations, and interactive quizzes and reviews that engage learners in theoretical knowledge and concepts. 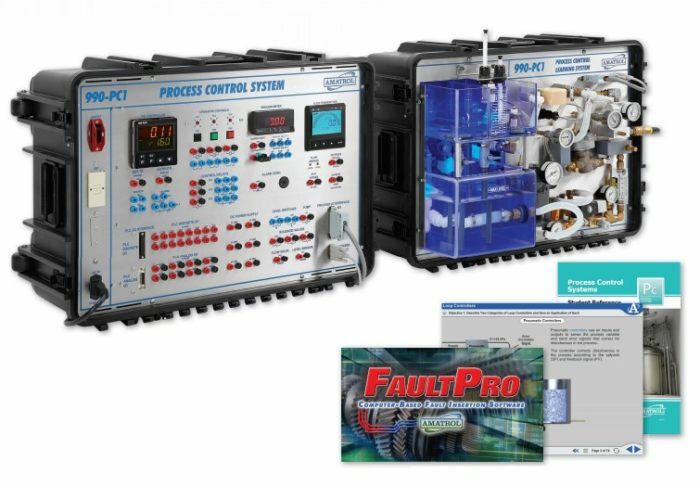 990-PC1F uses FaultPro, an electronic fault insertion system that is only available from Amatrol, to insert 30+ faults into the system for troubleshooting. During the learning process, FaultPro allows learners to insert faults in the system as they progress through the step-by-step procedures learning industrial troubleshooting methods. Then, FaultPro can be set to randomly select and insert a fault to test a learner’s troubleshooting abilities and prepare them to solve real-world technical problems once they’re in the field. Set within a durable ABS plastic case, the 990-PC1F features wheels and a handle to create a mobile training platform that can be used to deliver pneumatics training where needed and that’s easy to store and transport. The cover is quickly removed to enable the case to sit firmly upright on a table surface for any learner to use. A sample copy of the Portable Process Control Troubleshooting Student Reference Guide is also included with the system for your evaluation. Sourced from the system’s curriculum, the Student Reference Guide takes the entire series’ technical content contained in the learning objectives and combines them into one perfectly-bound book. Student Reference Guides supplement this course by providing a condensed, inexpensive reference tool that learners will find invaluable once they finish their training making it the perfect course takeaway.